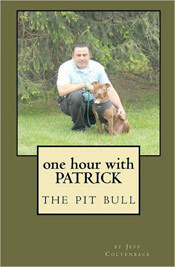 This book illustrates the one hour the author spent with Patrick the pit bull who was starved to near death. The author was enrolled to evaluate Patrick and give him a thorough temperament test for a custody battle. The book illustrates the events leading up to the evaluation, the evaluation itself as well as personal experiences of the author with other abused pit bulls. If this book doesn’t motivate you to want to help animals in need, then nothing will.